I love subscription boxes and I love stylish clothes! Imagine how thrilled I was when I found out that I was going to get a chance to review the Spring Collection from Elizabeth and Clark. Who? What? 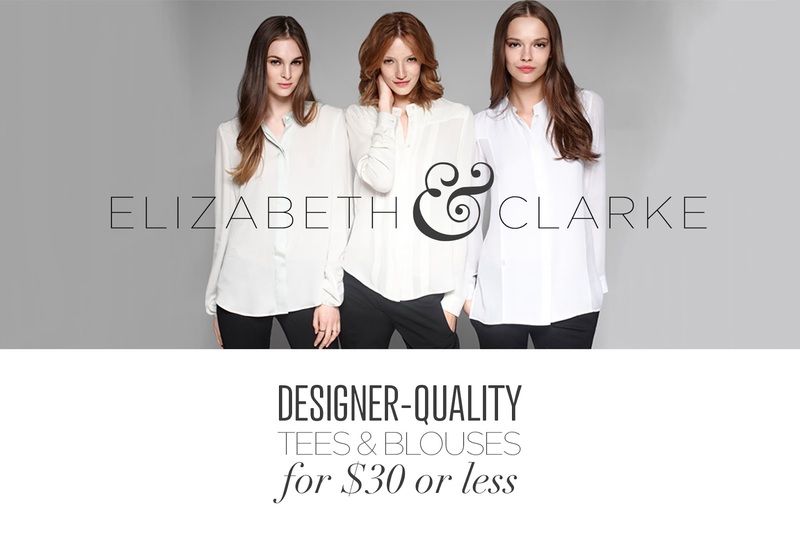 Elizabeth and Clarke is an amazing service that all fashionistas will want to learn more about. Imagine getting a box of shirts delivered right to your door each season. I am not talking about any old shirts either. I am talking about gorgeous shirts in a variety of styles. The Spring Collection was great. It totally exceeded my expectations. At first I was cautious... I am a mother and the shirts are white... but, I am not looking to be one of those women that live in a t shirt and sweat pants. I do dress up and try to look my best regularly. Elizabeth and Clarke actually sent the perfect color. I have avoided buying white clothing since the day my son was born. I forgot how lovely I look and feel in this color. I love the silky off white long sleeve blouse. It goes well with many of my maternity dresses which happen to be sleeveless. It is not really warm enough for bare arms here in Ohio, so this makes a classy addition to my dresses. The off white color goes with everything I own, and the material is so smooth and silky that I never want to take it off. The racer-back tee is fabulous. I love the slouchy pocket and the way this tee hugs my pregnant belly, giving me a pregnant and proud of it look. I was unable to wear the sleeveless white blouse with chiffon pleats, it was too snug on my ever expanding baby bump. (Insert Frowny Face here), but I have placed it in a safe place. This shirt is one of the first items I will wear to show off my post baby body. I have the skirt to pair with it already selected. I absolutely adore this service. I would love to get a subscription as a gift and I think several ladies in my life would feel the same way. You can get 1, 2 or 3 shirts each season. For 1 shirt you will pay $30, for 2 shirts the cost is $25 each. For 3 Shirts the price is a mere $20 per shirt. Try finding clothing of this quality at the mall for that price! I would highly recommend that you check out the website, browse around a little and subscribe for someone special, and or yourself. You will be pleased with your quarterly delivery of amazing shirts at low prices. Connect with Elizabeth and Clarke to learn more. Check out the facebook page to stay up to date with the latest boxes available.